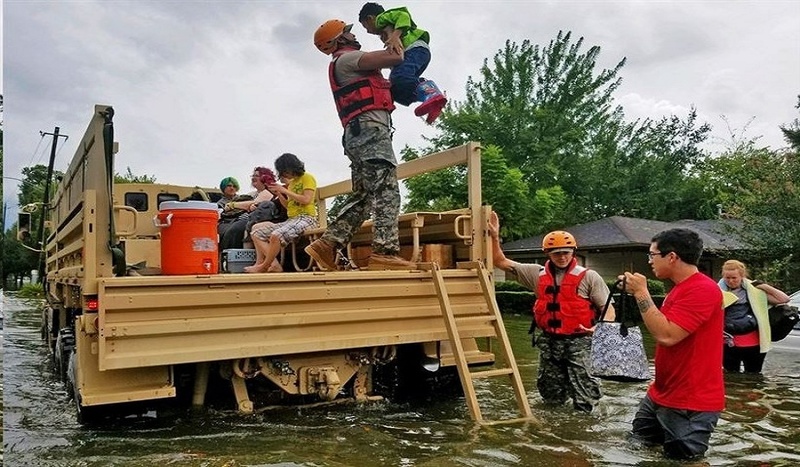 Weather forecasters are saying the remnants of Hurricane Harvey is causing “catastrophic flooding” in Southeastern Texas, as 3,000 Texas State Guard and Texas National Guardsmen have now been called up to help their fellow citizens, Texas Gov. Greg Abbott said today during a news conference in Austin, Texas. Harvey has been downgraded to a tropical storm, but the National Weather Service says the rain will continue. “This is really going to be an event that is going to continue to worsen,” said Daniel Porter, of the National Oceanic and Atmospheric Administration. Harvey is the strongest storm to hit Texas since 1961, Abbott said. The governor said the federal government has provided all the assets the state has asked for. The Federal Emergency Management Agency is the lead federal agency working with the state and local officials — 19 counties in the region have been declared disaster areas. During a National Incident Communication Conference Call on Hurricane Harvey yesterday, FEMA requested the Defense Department to provide a search and rescue package to the area. This consists of two planners, nine helicopters, two fixed wing aircraft and refuelers, and includes pararescue teams to operate from Joint Reserve Air Force Base in Fort Worth, Texas. In addition, DoD was asked to provide 11 generators and 50,000 gallons of gas and 50,000 gallons diesel to Fort Hood, Texas.